The midsize truck segment is a funny thing. All too often, our attention is drawn to its full-sized stablemates, with so many marketing dollars placed upon the likes of the F-Series or the Silverado. But at the end of the day, the face of the American truck-owner has evolved significantly over the last four decades. They’re looking for something a little more like the 2018 Chevy Colorado. While there are no shortage of work truck builds employed within the daily grind, there are an equally countless number of commuters and families that utilize trucks as daily drivers. With preferences ranging from bare-bones to luxury, many of these drivers simply don’t require heavy-duty capabilities. Easily accommodated by more modest utility, they find themselves better-suited by midsize offerings such as the 2018 Chevy Colorado. Starting around $20,200 MSRP the Colorado is accessible in its pricing, and overflowing in its attributes. Offering car-like maneuverability and impressive fuel-economy, the Colorado should be at the top of anyone’s short-list. Named ‘America’s Most Fuel-Efficient Pickup.’ It also offers ‘Best-in-Class Horsepower’ (with the 3.6-liter V6) and ‘Best-in-Class Towing’ (with the 2.8-liter TurboDiesel). These impressive numbers position it favorably against such offerings as the Toyota Tacoma and Honda Ridgeline, but ultimately it comes down to which characteristics you favor. 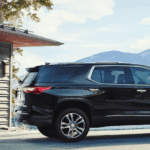 Available in five trim levels (Base, Work Truck, LT, Z71, and ZR2) the Colorado can be configured as needed, to fit the demands of your intended use. From no-frills to off-road ready, you have your choice of tailored builds and capable powertrains. A 3.6-liter V6 comes standard, paired to an eight-speed automatic transmission, channeling 308 hp and 275 lb-ft of torque. And the option of a 2.8-liter turbocharged four-cylinder paired to an eight-speed automatic sweetens the deal for those with an eye on fuel economy. Offering 181 hp and 369 lb-ft of torque, there’s no shortage of readiness. And of course, Chevy’s signature inclusion of available technology is another feather in the Colorado’s cap. This includes the Bluetooth connectively, compatibility with both Apple CarPlay and Android Auto, voice control and touchscreen interfaces, as well as the availability of OnStar Telematics and 4G LTE Wi-Fi. Such features make it ideal for both a work truck turned mobile office and a daily driver. But what if you’re just looking to get off the beaten road and have some fun? So, what are you looking for in midsize truck? Whatever it is, chances are, the 2018 Colorado has you covered.